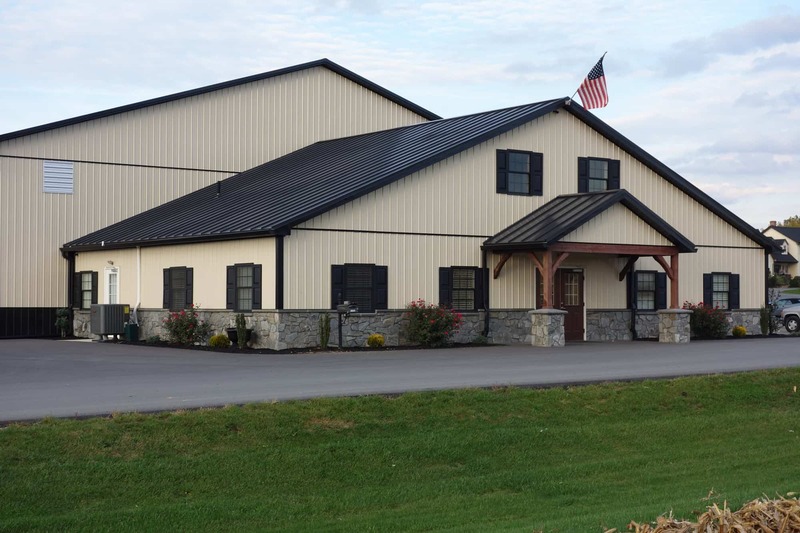 After operating its family-owned business out of two office trailers and a two-bay shop for many years, GFI Transport decided it was time to invest in a new facility on its Mount Joy, PA property. Company owner and president, Phil Garber, wanted to provide a bigger, cleaner working environment for his team, which specializes in hauling dry bulk commodities, particularly agricultural products. He also wanted a well-designed truck shop that would increase the company’s efficiency. GFI Transport requested quotes from several contractors, including steel-frame builders. The company chose stud-frame commercial contractor Quarry View Construction to design and build the facility. Our Quarry View team designed a three-bay, drive-through shop that allows drivers to enter the building on one end, get the service they need, and exit the opposite side. Drivers no longer need to back out of the shop when service is done. The simultaneous service layout also allows crew members to get back on the road faster. The new building was designed with doors that open on the east and west sides, allowing breezes to blow through the shop to reduce summer energy costs and keep employees more comfortable. In addition, Phil wanted a facility that would accommodate the company’s future needs. “We plan to be in the trucking business for a long time, but I’ve lived long enough to know things change. And if you’re not ready for it, that’s when you’ve got problems,” he says. As a result, our team designed the new structure to have potential use as an agricultural storage facility down the road. As with many large building projects, the GFI Transport team saw opportunities to make alterations as its project progressed. We worked closely with GFI to accommodate those changes, so the facility would be precisely what the transportation company needed. The new building, which was completed in September 2016, stands at 7,200 square feet. It includes a 2,400-square foot office space and 4,800-square foot shop area. If you’re considering a new stud-frame commercial building, get in touch with us. Let’s talk to find out how Quarry View Construction can help you build a high-quality, cost-effective structure for your business.